This time of year we typically tend to make decisions that will impact the coming year. David wanted his soul to be whole…. as it ought to be. Like David, we are entrusted with more than just our physical lives. Our soul has the ability to influence our eternity. So the most important account we could ever take is an account of our soul. 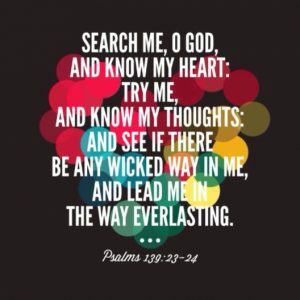 Over the next few weeks we’ll look at Psalm 139 and see how we can use it to take stock. Often we can make choices that look good but have bad motives. The choices we make are an overflow of the condition of our heart. the primary influencer of our choices is our heart. If you want to do an inventory of your heart, look at the why behind your choices. Look at the impact of your choices. am I investing my heart?” Because God wants nothing more than for your heart to invest in him, because he has already given his heart for yours. When we invest our hearts in God, we realize God, has invested his life for us. When you invest your life in something, you’re going to ultimately protect it. Not only has God invested in us, but he is present with us. When we forget God is with us, we become liable to fear. clutches of slavery in Egypt. Awhile after they were free, a few spies were sent to check out the land that God promised to give them. When they reported back that though the land was fruitful, it was flowing with milk and honey, they had a big BUT—- the people in it were of great size. They forgot God was with them, fear crept in like a disease. They soon forgot all God had done in their lives and all God was able to do. But two men named Joshua and Caleb stood up. They remembered. They trusted God was with them. Later Joshua rose as the leader of the Israelites, and the time came for him to lead them into the land God had promised them – even though he was facing opposition much larger than he was. But Joshua had already taken an inventory of his fears. He knew God was bigger than his fears, and was with him. Fear makes useless; God makes able. The more we are with God, the more we are without fear. King David also knew what it was like for God to be with him. If you were to take an inventory of your fears, what would you come up with? What are the shadows that are gripping your heart with fear? we’ll often end up pushing people down, whether we know it or not. alone, and we’re dirty. Our ways were offensive! Here’s the thing. God took an audit of all our offensive ways. He took an audit of all we have done and all we’ll ever do. Then he went up a hill to a cross on Calvary. Jesus of Nazareth, the king of the Jews, he took all our offensive ways too. Jesus is the one person who has ever had a clean audit in his life, and he gave his life for you so you can be washed clean of all of the dirt, of all of the sin, of all the offensive ways and the muck that being king of the hill leaves on us. So in our account of the soul , we look back to take stock, so that tomorrow could look different, so tomorrow could look better. It turns out that if you only get on a scale once a year, or if you only look at your financial records once a year, life and things can drift away from you. But if you take an account on a regular basis, the movement toward flourishing or wholeness becomes more reachable. to walk alongside as we journey toward wholeness.